Liquideep, Neal Conway, Dana Weaver, Sheldon So Goode, David Anthony, Beverlei Brown, Qb Smith, Lady Alma, Kabomo and more. This show was 1st in the global house music chart and 1st in the global soulful house chart. 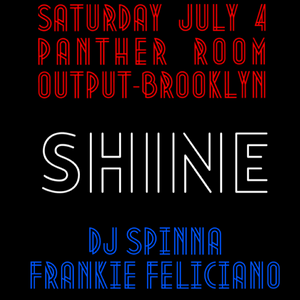 House Music Pioneers Dj Spinna and Frankie Feliciano will unleash straight heat mixes as they prepare for their premier of Shine which debuts in the Panther Room of Club Output, in Brooklyn NY on July 4th. Classic New York party vibes will prevail. Get ready! what is the first track called? I grooved on the Kitchen dance floor, Thanks so much!! !